Jess Jackson died of cancer recently at the age of 81, after a life of achievement that made him a titan of American wine. Unlike silver-spoon millionaires who [I borrow here from the great Red Smith] were born naked into the world and had to inherit everything they have, Jackson was in the grand but fading tradition of the self-made man. Born during the Depression, Jackson pitched in early to help his family, starting as a paper boy at five and going on to work at many other jobs— cop, teamster, stevedore and ambulance driver, among them—to put himself through law school. After success as a lawyer he stepped away from the bar and in 1974 proceeded, with his first wife, Jane Kendall, to buy and replant, 80 acres of pear and walnut trees. He was a grower until a late-cancelled order left him lumbered with a crop, so he began making wine himself. 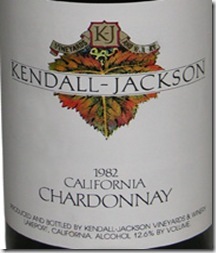 Kendall-Jackson’s first Chardonnay was the 1982 vintage [below]. It was successful, attracting many new recruits to wine largely because of its evident sweetness [which was, some say, a happy accident resulting from a slip-up during fermentation]. 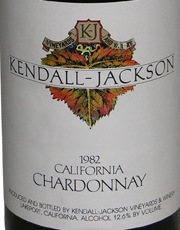 His wine to a large degree established Chardonnay as America’s favorite wine and K-J as its favorite Chardonnay. Snobs never forgave Jackson for that: as Americans have grown what some like to think of as more ‘sophisticated’ about wine a coterie of snobs and geeks has bred and inbred apparently for the sole purpose of scorning success. As so it follows as the night the day that such folk amuse their self-important selves by heaping scorn upon K-J. they are, they think, far too good for a wine produced in such quantities that ‘bottles’ and ‘cases’ have no real meaning and the only graspable unit of measure is probably metric tons. K-J Chardonnay may not be the artisanal or ultra-natural or bio-confragable stuff so beloved of the snooty but showed and still shows showed thousands and even hundreds of thousands of people that there is life moistened only by Coke, Fanta and Mountain Dew. Jackson is survived by his wife, Barbara Banke, and five children. 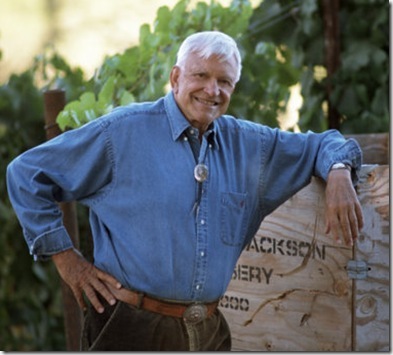 All are active in Jackson Family Wines, something of which Jess was extremely proud. The Family will welcome anecdotes and recollections sent to [email protected].